Jordi Diaz: "We get information every time Barcelona scores a goal"
When Lionel Messi scores another wonder strike, the city of Barcelona literally shakes. 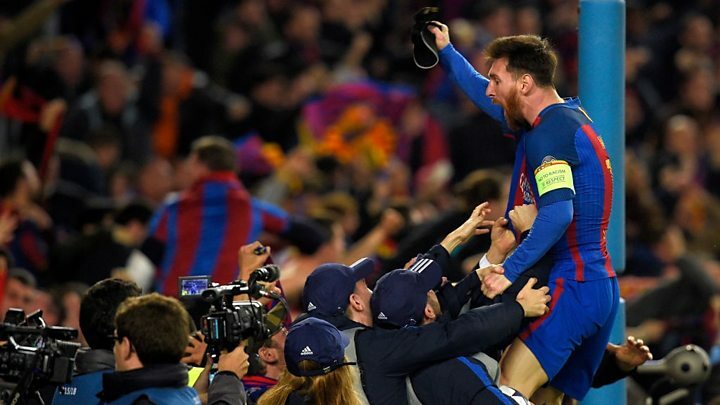 Scientists have a seismometer installed close to the Camp Nou stadium and it picks up the telltale vibrations every time the crowd celebrates a goal. There is a clear spike in the data as fans jump up and down. And the seismogram that perhaps best captures this is Barca's "miracle comeback" against Paris Saint-Germain in last season's Champions League. Four-nil down from the Round 16 first-leg, the team scored a last-minute goal to claim a famous 6-5 aggregate victory at home. This soccer seismology has been discussed here at the European Geosciences Union (EGU) General Assembly in Vienna, Austria. It is the work of Jordi Diaz and colleagues at the Institute of Earth Sciences Jaume Almera in Catalonia's capital. What Dr Diaz finds fascinating is the contrast in crowd signal between the movements of sports fans and those of music fans.